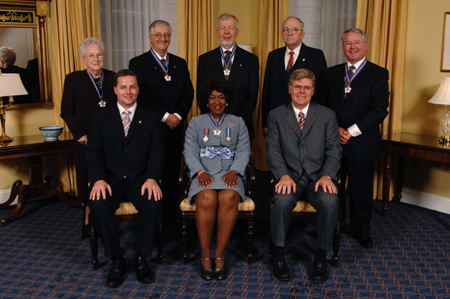 Back Row Left to Right: Joyce Carmen Barkhouse; Peter Stephen Clarke; Thomas DeVany Forrestall; Ronald MacDonald (on behalf of Flora Isabel MacDonald); William D. Stanish. Through her stories of the famous and the not so famous, this renowned children's author and former teacher has brought Nova Scotia's history alive for children everywhere. Her best-known work, Pit Pony, set in the Cape Breton coalmines at the turn of the century, was the basis for a movie and a television series. 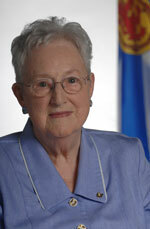 It won the first Ann Connor Brimer Award in 1991 for outstanding contribution to children's literature in Atlantic Canada and, along with The Witch of Port LaJoye and George Dawson, The Little Giant, is one of three of her works that have been named as notable books by the Canadian Library Association. She is a founding member of the Writers' Federation of Nova Scotia, so it is fitting that the federation's prize for writing for children should bear her name. Her writing has the unique ability to convey to youngsters in our province important aspects of their history and to understand the challenges and contributions of the Nova Scotians who came before them. He resides on a fourth-generation, 750-acre family farm in Woodville, Nova Scotia, and is known locally and nationally for excellence in the agriculture and agri-food industry. He is specifically renowned within the Canadian egg and poultry sector for his work in setting high quality standards for food safety and has received numerous awards for this work. He is Chairman of the Board of Directors of ACA Co-operative, a company that under his leadership has achieved consolidated sales in excess of $100 million. It is also the fourth-largest co-operative in Nova Scotia and the second-largest non-government employer in the Annapolis Valley, employing almost 675 people. His contributions to the agriculture and agri-food industry have left a valuable mark of excellence and outstanding achievement in our province. 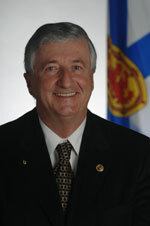 He is also active in his community, serving as a volunteer firefighter for over 19 years, a Rotarian in the Rotary Club of Kentville for over 15 years, and he sits on international, national and provincial boards and committees, including the USA United Egg Producers, the Canadian Egg Marketing Agency, Nova Scotia Egg Producers, and the National Pullet Growers Association. He is a seminal figure of the visual arts in Nova Scotia. As an artist of international repute, his exhibition record serves as a testimony to his significance in the art world. Born in Middleton, NS, he has made Dartmouth his home for many years. With grace and selfless devotion, he has served local and regional committees tirelessly and has contributed his time and expertise to a host of cultural and arts organizations. For decades he has made meaningful and widespread contributions to the cultural vitality of our province. He has produced a formidable body of work in painting in egg tempera and watercolour, drawing, sculpture, and other media. Simply stated, he is one of the most significant Nova Scotian artists of the past century, and the importance of his work to the development of the visual arts in our province, and our nation, cannot be overstated. The Art Gallery of Nova Scotia (AGNS) will be mounting a major retrospective of his work in 2008. She is a trailblazer for women in politics, a humanitarian, and a champion of human rights, lauded for her courage, her sensitivity, and her plain good sense. A native of North Sydney, she was the first woman in Canada to hold the portfolio of Secretary of State for External Affairs and was instrumental in Canada's agreeing to accept 50,000 refugees from Vietnam, the so-called "boat people." She also held the cabinet positions of Minister of Employment and Immigration and Minister of Communications and Culture. Through her international humanitarian work, particularly in the areas of human rights, peace, security, and social and international development, she has made a difference in the lives of tens of thousands of people around the world, including India, Afghanistan, Kosovo, and Tibet. Her work has been recognized through numerous awards, including honorary doctorates from 17 Canadian and international universities, the Pearson Medal, and the Padma Shri Award, the highest award bestowed by the government of India. 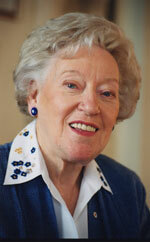 She has also received the Order of Ontario and is a Companion of the Order of Canada. He is a world-class orthopedic surgeon who has brought international recognition to sports medicine in Nova Scotia. As an award-winning student athlete, his intense interest in sport brought him to the field of orthopedic surgery, and he has worked with elite athletes beginning with the 1976 Olympics in Montreal and was Chief Medical Officer for the Canadian Olympic teams in 1984 and 1988. He is a professor of orthopedic surgery at Dalhousie University, who has lectured worldwide and has contributed to more than 182 publications, including co-editing one of the world's major sports medicine texts. 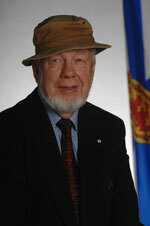 He has received many medals, honours, and awards and was inducted into the Nova Scotia Sports Hall of Fame in 1997. 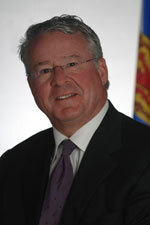 He is an ambassador for Nova Scotia and widely espouses Nova Scotia as a centre of medical excellence. His positive attitude in dealing with his patients and his ability to sell Nova Scotia have been instrumental in facilitating the recovery of patients and in the recruitment of doctors, coaches, and athletes to the province.